There have been times in my life when I've been good at keeping a journal. As a teenager, I wrote weekly if not daily about the stuff that interested me: movies, music, books, girls. Sometimes I wrote profound things. Most of the time I was angsty and melodramatic. I thought of myself as a great writer back then, and I fully expected my journals to make it into print. Fifteen years later, they are still on my shelf, unpublished. And I think they'll stay that way. Mormons have a long history of publishing journals and diaries. Joseph Smith's diaries became the basis for the History of the Church and are currently accessible in the original through the Joseph Smith Papers project. William Clayton's journal is one of the best primary documents about the trek west. Wilford Woodruff's journals are legendary for what they tell us about Church history and the character of early leaders. But let's be honest. Most of us aren't writing journals of that caliber. Heck, most of us aren't even writing journals. We're blogging, tweeting, Instagraming, Facebooking, and—if we really get desperate for a social media fix—Google+ing. The print journal or diary is on its way out as our life's records becomes increasingly digitized and pixelated and confined to 140 characters or less. But it's not dead yet. Private journals—whether written on paper or tapped out on a word processor—still fill a void. When we don't want to share our latest disappointment or heartbreak with the world—when what we have to say is still too embarrassing to share with our 589 Facebook friends or 239 followers on Twitter or the 97 people in our Google+ circles—we turn to the journal. We write in it because we know no one else will read it. Unless we publish it. Then it becomes something else, something hybrid and rare: a book written in secret, but shouted from the rooftops. 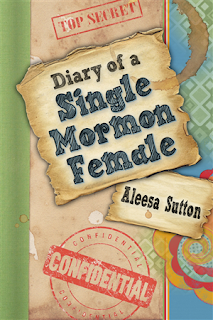 Aleesa Sutton's Diary of a Single Mormon Female is such a book. Begun, in a manner of speaking, when Sutton was eleven, it follows her life from the manic idealism of adolescence to the frustrations of post-BYU Mormon single life. Much of the book is composed excerpts from the her many journals intercut with snarky or reflective commentary from her older, wiser (but still single) self. Sutton's main focus is on the many relationships and non-relationships that have helped define her identity as a "Single Mormon Female." However, her focus is not solely on men and failed relationships. Along with accounts of awkward first dates and sloppy first kisses is a portrait of Sutton coming of age and discovering herself, her dreams, and her faith. Readers of Diary of a Single Mormon Female, of course, will find that it's similar to other books that have been written about Mormon single life. Admittedly, I'm no expert in the genre, but aspects of Diary remind me of memoirs like Elna Baker's The New York Regional Mormon Singles Halloween Dance and Joanna Brooks’ The Book of Mormon Girl as well as novels like Chris Bigelow's Kindred Spirits and Helynne Hollstein Hansen's Voices at the Crossroads . Readers who appreciated these books, or fell madly in love with them, will likely enjoy Diary. But Diary differs from these books in that it is a diary. In this book, readers encounter two main voices: Sutton the Diarist and Sutton the Commentator. Sutton the Diarist is animated, emotionally raw, philosophical, and much less self-conscious as a writer. Sutton the Commentator, on the other hand, is more reserved, more aware that what she says may have some consequence. Yes, she is snarky and self-deprecating about her earlier days and past relationships, but she’s also confident that her story has a message. Both voices bring different things to the table. They complement each other, rather than compete. As readers, we identify with Sutton the Diarist, but we learn from Sutton the Commentator. Overall, Diary of a Single Mormon Female is an entertaining book with important lessons for all Latter-day Saints, including bishops, Relief Society presidents, and other leaders. As an window into modern-day Mormonism and Mormon identity, Diary also has much to offer readers who aren't Mormon. In fact, I found Sutton's experiences much more similar to my own as a Latter-day Saint than those described by Joanna Brooks in Book of Mormon Girl. Like my upbringing in the church, Sutton's was centered on Seminary, Church dances, Sunday school, and Youth activities. Absent are the relics of Cold War Mormonism that seemed to define Brooks' youth in her memoir: the apocalyptic food storage, the Cleon Skousen, the Cult of Osmond, the Mormon Nationalism and Culture Wars. Sutton gives non-Mormon readers a view of a milder Mormonism that better reflect, I think, the Church we know today. Of course, I feel Sutton at times over-explains the Mormon aspects of her book. This is understandable, though, since Sutton the Diarist writes in Mormonese, using terms like "testimony" and "YSA" that leave the uninitiated begging for a Urim and Thummim. This is more of a problem at the beginning of the book rather than the end. Early on, it is clear that Sutton the Commentator is still trying to find her voice, so it reads like the uneasy first hour of a blind date. As the book progresses, and Sutton's relationship with her reader deepens, the commentary becomes more fluid, comfortable, and sincere. By the time Sutton the Diarist is catching trains across Europe, Sutton the Commentator is hitting her stride. I realize I've said a lot about the Diary aspect of this book, but not much about the Single Mormon Female part. That probably reveals more about me as a reader than it does about Sutton as a writer. The truth is, the book is all about the hopes and struggles of single Mormon life—especially the unique challenges of being female and a single Mormon. Having never been a single Mormon female, I was fascinated by this glimpse into a world I have only ever seen from the outside. Personally, I think this book should be required reading for Mormon men, especially single Mormon men over the age of twenty. Every mother should get it for her son when he returns home from his mission—with a note that says, "Don't be a jerk." Should you read Diary of a Single Mormon Female? Yes. It is an honest book that has something to offer every reader—whether that reader is a single Mormon female or a modern Mormon man. Besides, if nothing else, it will inspire you to dust off your old journals and look back over the years that have shaped you. That's one of the nice things about reading about someone else's life: it gets you thinking about your own.